I don’t know about you, but for a long time, this verse bothered me. I was supposed to be listening for his voice, but mostly all I heard was silence. Get a Free eBook: Do you want to grow closer to God in your prayer times? I’ve written a free guide called The Three Day Listening Prayer Devotional and I’d love for you to download it. Click here to download the free devotional. The silence pointed to a deeper frustration. All my life I had struggled with this problem: I had accepted Jesus as my savior and was supposed to have this personal relationship with him, but it didn’t feel very personal. She meant, had I read the Bible and prayed? My devotions were dry, routine affairs. I’d whip through a chapter in the Bible. I’d run down a list of prayer requests, and I’d check that part of my day off the list. What a contrast with, say, a date with my girlfriend. When I took her out for dinner and a movie, sometimes we missed the movies because we couldn’t stop talking. Our conversations had a momentum all their own. How discouraging that the relationship that was supposed to be the most exciting and wonderful in my life had become a check on my to-do list. Maybe you are like me—you grew up having monologues with God and have never heard before that he wants to talk to you. You’ve not really learned how to hear his voice. After that, we all began to grow in our ability to listen. We would ask the Lord questions, then listen, and he often spoke. 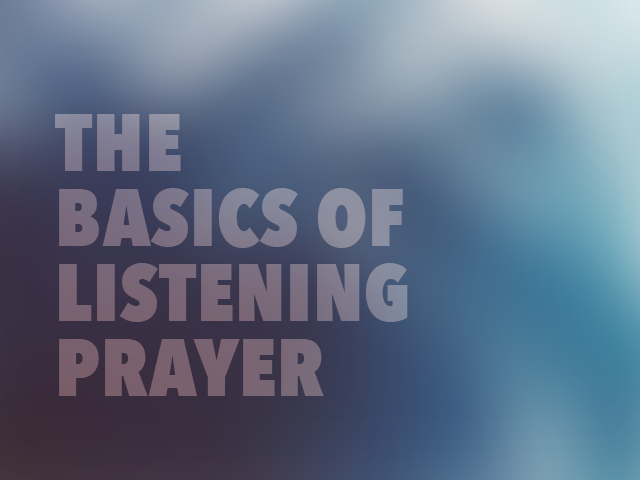 What Does Listening Prayer Look Like? In 1998, Allie Pohlmeier traveled with a team from Judson College to do a project in Matamoros, Mexico. As so often happens, her heart was touched by what she experienced, particularly by one family for whom her team built a home. They painted it green. Before leaving, she took a picture of herself with that family in front of the home. Eventually Allie gave in, and taking the picture of the house with her, started off. She looked up and down the first street—no green house. She felt ridiculous, but knew she must obey. She saw a girl walking down the street, so she approached her. The girl studied the picture and slowly a look of amazement came to her face. As it turned out, she was only a block away from the green house! What Allie experienced shouldn’t be unusual for those of us who listen for God’s voice. Christianity is a personal faith. God wants to talk to us. He wants to guide us, but we have to listen. How do you listen to an all-powerful but invisible God? The Bible has a lot to say about it. Over and over God interacts with people in a variety of ways. Our God is endlessly creative in how he communicates with them. God spoke to Daniel through visions, Balaam through a donkey, Peter through a rooster, and of all things, he spoke to Moses out of a shrub. There are hundreds and hundreds of examples of God speaking to people in the Bible. It’s his modus operandi—and he gives detailed instructions for this in both the Old and New Testament. We also have a rich history of God speaking to man from Jesus’ time until the present—people like Augustine, Mother Teresa, Joan of Arc, and Brother Lawrence. In our relationships, we are so distracted and busy that it’s often the exception rather than the rule that people listen to one another, much less listen to God. We need to learn how to listen. So I did a survey. “How many of you feel as though you hear clearly from the Lord?” The answer came back: 46 percent. The same figure! I don’t think it’s a coincidence. Frankly, almost everyone struggles to hear God and many people have never heard him. Learning to hear the Lord’s voice isn’t complicated. But it does require some discipline to find a quiet place and to allow some time just listening. Set aside at least half an hour to start. When you are ready, quiet yourself. If stray thoughts come through your mind, write them down on a separate piece of paper. Read some scripture. Ask the Lord to speak to you through it in a way that you can understand. Ask God to protect you in Jesus’ name from deception. Then write down your question for prayer. Pause. This is where you wait and listen. God may direct you to another passage of Scripture. He may share a tender word. Whatever you feel he may be saying to you, write it down. Ask him to confirm anything he shared with you. Use a journal; it will help you focus. Plus it’s a great resource to look back and see the journey the Lord took you on. It also helps fine-tune your spiritual ears to better hear him. Writing down your impression of the Lord’s responses creates in you an expectancy that he will respond. If, when you sit down to pray, you often have a to-do list pop up in your head, then have another piece of paper handy to make a list with any other thoughts that pop up. It’s okay and it’s natural. Just let them come out so you can focus. Was it a clear word or just an impression? God may give us different degrees of confidence in what he has said. We therefore need to humbly admit our fallibility. Get someone you trust to check your impression and to confirm it or not. Can You Really Know the Voice of the Lord? Vicki Gross was struggling with how to recognize God’s voice, and described a breakthrough that the Lord gave her. I was on a school bus full of jabbering, yelling kids. My son was in the back of the bus. There were 20 rows of children making noise between us, but as I listened, in the back, I could make out the distinctive voice of my boy. To anybody else who didn’t know him, his voice would have blended into the cacophony, but because I know him, I recognized his voice. God’s voice is distinctive. He promises that we, his sheep, will hear it. The more you pause and listen for his voice, the more you will find that your ears tune in to it—you become familiar with it. It just requires your listening. Get the free devotional: Deepen your intimacy with God as you pray through this three-day devotional on Listening Prayer. Click here to download the devotional. This post is by Seth Barnes. Seth is the author of The Art of Listening Prayer, a month-long devotional that will help you hear the voice of the Lord more clearly and apply his direction to your life. You can click here to purchase the devotional. I tried for several years to listen to God’s voice… But can’t. I am giving up now. Is it that God isn’t talking or you aren’t getting the answer you want? That was a struggle I had for a long time. Remember, God doesn’t always speak to you in the ways you think He will. He may use someone around you, an unrelenting notion in your heart, scripture, or a plethora of other methods. God often speaks to me through songs. Don’t give up because He hasn’t given up on you. It will happen. Just be still. Don’t give up here is a place you can learn how. Mark &Patti Virkler have videos and books on how to hear God. I have been trying also with that video below and have trouble. I read Mark Virkler’s book and heard his preach/video,but still cannot hear Lord’s voice, maybe I am a fool. And Scripture says that people hear His Voice outside the pages of Scripture. It never contradicts Scripture. Probably just more refined or specific things. Teachers never talk during a test. If you give up, you will not pass the test…this time. It depends on what is going on in your mind. Sometimes I hear nothing because there is something going on. For me, the best way to listen is to wait until something happens, then pray about it. Don’t give up. He’s listening, you have to hear through life’s noise what he is saying is your path! Try going through a traumatic experience and crying your heart out to God when he is the only one left to comfort you. That should do the job. I learned a very valuable lesson in prayer recently. Our pastor gave a message on never walking away from the altar empty handed. We may not get the answer we want or desire or even think what our prayer intention is. Recently in my own life God revealed part b if prayer to me. Often times we pray for a very specific situation in life ( bills, sickness a job etc…) I prayed in the middle of turmoil last summer for wisdom and knowledge. I started back to church and trying to get closer to God and develop my relationship with Him. In late November and early December I was deceived by am employer financially and it began to hurt our families budget. Instead of taking it to court I prayed to God that what is done in the dark be brought to light. Little did I know both prayers were to be answered months later now in 2018. A true reminder of Gods timing and will not always what our thoughts and desires on earth be. TO God Be the GLORY! Try to listen to God in prayer in community. I am thinking specifically of a Lectio Divinia group . Hard to find but worth it. Read the Bible that’s how you hear his voice. We are saved simply by accepting Jesus Christ as our lord and saviour. The steps we take after accepting Him only help us to grow in our relationship with Him. Anything we do or don’t do after honestly and truly accepting Him, does not change the fact that we are saved, because being saved means all our sins and shortcomings are forgiven. I used to hear God’s voice very clearly, but in recent years, it has become muffled. I blame nobody else but myself for that, but I believe that I am still saved. I encourage you to pray, to seek Him, and in time, according to His plan, He will reveal Himself to you. I also encourage you to understand that if you have been a believer since 2003, you are most definitely saved. I have been a sinner all my life I have lied to my family and my girlfriend, and it was because of my current girlfriend that brought me back to God. I was an atheist for a while about a year ago. I thought he didn’t exist and was just a made up character. Question is am I saved now? I’ve accepted Jesus Christ as my savior and thanks to lovely girlfriend. Will He forgive me? Yes Taylor He forgives you! 🙂 He forgives all our sin as we come to Him sorry for what we did. The power of His forgiveness is greater than any sin because He was without sin and died for our sin. One drop of Jesus’ blood is sufficient to cover all the sins for all of mankind for all of History. Hard to comprehend but He truly died for your sins because of His great love for you! Ils insultent Marca, organe puissant du pays dont la version papier est une grosse merde, car la finale de la Liga de foot et le Nadal Fed se dÃ©roule en mÃªme temps. ImpÃ©ratif financier impossible dans d’autres pays. Connaissant l’Espagne, quelques dÃ©cideurs ont dÃ» baisser leur froc contre un chÃ¨que. Cela pouvait Ãªtre aisÃ©ment Ã©vitÃ©. Et 2de raison, Santana, paraÃ®t qu’il est trop pro-Nadal, enfin je sais pas.5 finales d&l2f17;a8fi#Ã©e, c’est un record Franckie? Yes, He will He is real good at forgiving. I know if i was you get baptized and ask them for the Holy Spirit. You know what the best thing to do is ? Confess all your sins to Him. I confessed all my sins and He forgave me. I have the Holy Spirit but for some reason I bought books on how to hear Him and I can not still hear him. So if you do not hear the HolY Spirit you can not do the Healing heart wounds you know generational sins and curses,Severing Ungodly soul ties, replacing negative expectations and renouncing inner vows, receiving divine visions(People that could not forgive)Breaking word curses and casting out demons. We all have demons in us. But we have to get rid of their home by doing all those prayers first. The book is called Prayers that heal the Heart. But if you can not hear God I do not think you can do them. Cause you have to ask the Holy Spirit what is in your heart. You know like ,anger, Depression, etc. may I borrow the “listening prayer exercises” portion of this post to share with my congregation to provide a bit of a guide for them? There is also a slim book called God Guides that was written by a missionary that has The Listening Prayer. This prayer is especially powerful as you are binding everything that is not God and asking for his wisdom. I believe God is faithful to his word.all we need is to pray,be patient,read the word of God,focus and always get connected with the spirit of God in us. Ask God to help you hear His voice, and then have FAITH (believe) that He will do it. Faith is the key. He is faithful! Hello…when you accepted Jesus Christ as your personal Savior…You heard his voice…He called you…you heard him! !You became his child…now stop making excuses!! Stop the sin! !Get right with him ask for forgiveness and walk with him..Read his word,witness for him,do it all in faith…you will hear his voice..If you don’t have the Holy Ghost pray and ask God to fill you with the power!! Take care and God Bless. As you read the Bible, listen to the voice — it’s His voice. Get comfortable with the sound of His voice and the way He thinks as you read. Are you sure that voice is God…or is it you?